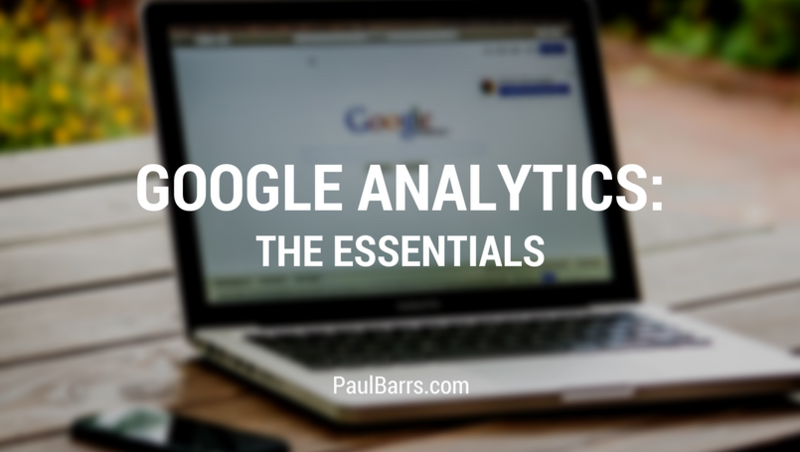 You can always take Google Analytics and build an analysis beast out of it, but it’s not necessary. In this video we’ll cover the most essential elements of analytics for small business. Good morning, good afternoon, good evening, whatever it is. Welcome back to another YouTube update. My name is Paul Barrs. This month we have been talking about Google Analytics and I admit I have been a little slow on getting the videos up. So I’m going to package this particular video for you in a short, simple, sweet message. Something that you can easily follow. And these are, I guess, is a summary of the most important parts of Analytics. There’s a whole lot more to it than what I’m going to share with you right now, but these are the most important. I don’t know if I can say that strongly enough for you. Here’s the simple process that you need to be going through each and every month when it comes to looking at your Analytics. We’ll have time to go into more detail another day. No. 1. You want to be looking at where your traffic is coming from. The acquisition reports in Analytics, See once you get an understanding where your traffic is coming from, you can look at it and go, “Hmm. Is that good quality traffic?” Or, “Can I increase more?” if it is, or “should I try and stop that?” if it’s not. Now of course the only way to look at this would be through the referral reports. We’ve got different options. We might be getting traffic from social media, we could be getting traffic from SEO, we could be getting traffic from referral. I guess they’re the three general areas. Now as you’re going through your reports it’s important that you look at the referral traffic for example. Have you noticed a lot of referral spam that we seem to be getting this days, things like buttons for web sites and places like that? Well that is just literally referral spam from bots who haven’t configured themselves correctly and are screwing up your analytics. So you need to do some research. You’ll find on my Tools and Resources page in my blog – go to paulbarrs.com/blog, right there at the top, Tools, Links and Resources, I have a good link to someone who could help you get rid of all that referral spam. So you can work through them or have me arrange that for you. It’s important that you get rid of referral spam even simple things like, you might find your own web sites referring traffic to you. Just means things haven’t been set up properly in your analytics. Now one of the reasons why that’s so important to understand is, if you have this things coming, in they completely mess up the numbers and none of it really makes sense. So No. 1 is you need to look at your incoming traffic, where is it coming from, particularly the referral traffic and remove referral spam. Once you’ve done that, then you can look at the genuine traffic sources. You have to ask yourself, “Who is this, or what is this, and is it delivering to me traffic which is converting?” How do you know if it’s converting? Well that means you need to also be setting up Goals. There are very simple Goal parameters within the admin area of Analytics. Say for example you’ve just got a basic contact form on your web site. They submit that form it goes to a “Thank you” page, now it needs to go to a “Thank you” page to have it setup for what it’s called a URL Destination Goal. That goal is the destination the URL they end up on. So if you set that up as a goal, woohoo, goal achieved. Then someone comes, say, from Facebook and they click through and then they go through and they submit that contact form and they get to “Thank you”. Bang. Goal achieved. That is how it works at its simplest level. You know that that traffic from that campaign or from that page or whatever you might have been doing with Facebook – and yes you can also use their traffic for more detailed analysis just from them. Their tracking data, I should say. You know it came from there or it came from there and it converted. You can do the same with your shopping cart and set it up at a more advanced level. There are other goals, time on site, pages per view, or event based goals like, “we’ve watched this video” for example. The goals allow you to work things out. Now there are two ways to get your goals set up properly. No. 1 is come to someone like me and I can arrange that for you. No. 2 is go to Analytics and go to their help documents and just read through them. If you have the time, if you have the ability, that’s a great thing to do. I think you should learn it if you can. If not, get someone like me to do it for you. So you look at where your traffic is coming from and then whether it’s achieving its goal. What happens between here and there? Well that’s a good thing to know. So once you have goals set up you could also see that through-line traffic and it’s in the very bottom section under “Goals” there with “Analytics” and see where the traffic’s going. What pages they’re looking at and then where they drop off. For example, that exit page, or where they go after that. These are good things to know. Don’t you think? In a nutshell it comes down to this. You need to know where your traffic is coming from, then, what it is doing, and No. 2 if you can, where they go. Now you’ll never know necessarily where they go, but, where did they leave your web site? That’s a good thing to know. Say, for example you’d just put up a new product and you have ads and you’re drawing people to that product and they’re looking at that in your shopping cart, and they’re not buying. Now you can guess, “Well I sent lots of people to this page and they didn’t buy, therefore it wasn’t working.” Now what was the problem? Was it the ad that wasn’t working or was it the purchase, the sales page? Maybe it was your shopping cart process. How can you know unless you’re tracking that as a goal through Analytics? You can find out whether there’s . . . what the shopping-cart abandonment rate is and where it’s taking place in that process. Maybe you have a blog like I do, which I try and post content to every week, regular, fresh updating content. Well you see, from my blog, because I have a number of subscribers who receive notifications either through RSS or through email or through social media, they come in, they have a look at that and then they leave again. So it’s bounce rate, obviously, is quite high. But I also send the same thing out to my customers. They’re already customers. It’s okay. But if I didn’t have that following and my bounce rate was so high, I’d be a little bit worried. So that’s another good thing to track, bounce rate. Particularly for your primary conversion pages don’t worry about it across the board for the site, not such a problem. Look at your “Home” page, and look at your primary content or conversion pages. Are people are arriving on those pages? If they are, great. Where they coming from? But are they leaving straight away, as well? That’s something you need to know. Then you need to know how to fix it, how to make adjustments, how to make change. So I’m actually going to talk about that in the next video. The things that we can do to change the numbers and I will include just a little bit – something what you’d call “content experiments”, which is comparing page A to page B, simple things. But for today, most importantly you need to have a look at your analytics. Where is the traffic coming from? What is it doing when it’s there? Then at what page are they leaving? These are important things to know to improve the performance of your web site. You have a great week and I’ll talk to you again real soon. Bye-bye.